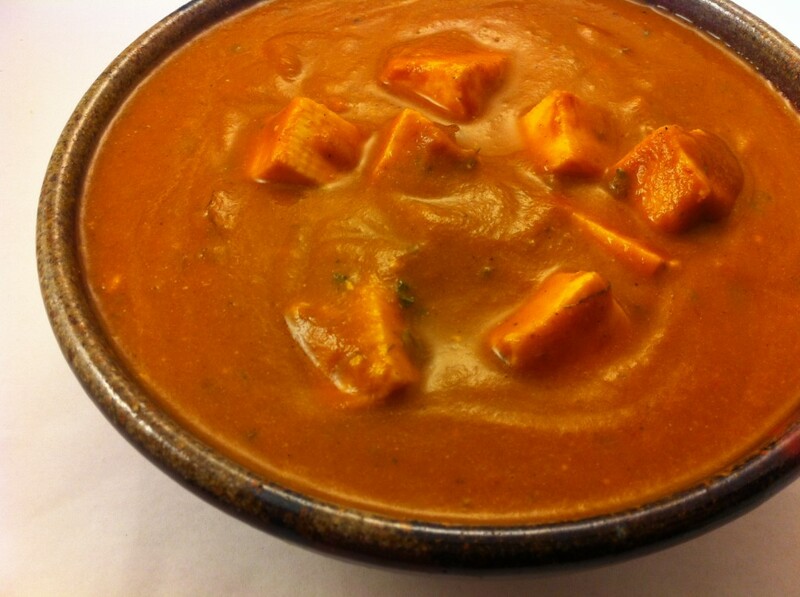 Paneer makhani is a mild Indian cheese cooked in a rich delicious buttery tomato gravy. Paneer makhani and yellow dal is basically what my husband, Tejas, and I get every time we go to a north Indian restaurant! Okra fry sometimes too. I’m hungry as I write this and now okra fry sounds sooo good! Anyways…Years ago, I was taught the basics on how to make makhani gravy and over the years I have always made it a little different, sometimes using fresh tomatoes and tomato paste, sometimes with canned tomatoes, using different spices such as omitting the cardamom because Tejas isn’t a fan, using whole spice, using ground spice, adding ground cashews or fresh methi leaves, etc. Once I even used a can of Campbell’s tomato soup because there was nothing else tomatoey in the house and it turned out delicious! As I found out later, supposedly the famous “tikka malasa” was created in the UK using tomato soup (not sure if this is true or not). Paneer tikka masala is a very close recipe to paneer makhani but the paneer has been marinaded and grilled in a tandoor before being added to the curry. We try and be a little health conscious during the week, so for this version I used very little makhani (butter) and whole milk instead of cream. Except for that I love how butter looks when it kinda separates out of the curry, it still tasted very rich and delicious! Tejas said once that he doesn’t like to use whole spices in anything that gets blended and that made a lot of sense to me, therefore this recipe uses all ground spices. Fresh ground spice is best! This isn’t a super fast dish because it needs time to really get the flavors going, but there aren’t a lot of steps and you don’t have to watch it all the time. We like it spicy and sweet so adjust to your taste. Heat the butter in a medium sauce pan over medium heat and add the onions. Cook stirring often until the onions are starting to get really caramelized, adding the green chilis part way through cooking. Add the garlic, ginger, tomatoes, ketchup, turmeric, chili powder, coriander, garam masala, sugar and salt, and cook for 20-30 minutes to really get the flavors to meld. Blend in a blender in a couple of batches with both the milk and water to get it to the consistency you like. Pour back into the pan, adjust salt and sugar, and add the kasuri methi leaves and paneer. Cook until the paneer is soft and heated through. You can also pan fry the paneer in a little butter first, then soak in a mixture of yogurt, hot water, and salt until ready to add to the curry. Service with whole wheat paratha or naan, green chili raita, and onions with lime and chaat masala.